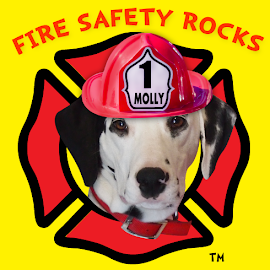 Fire Safety Rocks: Molly's 2nd Birthday Give-Away! It's my birthday and me and my good friends at First Alert have some amazing prizes to give away to help keep you and your family safe! We are giving away TWO prize packages, each prize package valued at $300! 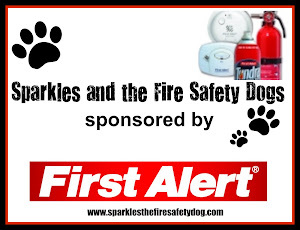 Each prize package includes: 3 First Alert Combination smoke/CO alarms with voice, 2 First Alert ATOM smoke and fire alarms, 3 Tundra Fire Extinguishing Sprays, 2 Safety Pods and a pawtographed photo of me! Special thanks to all our friends at First Alert for these amazing prizes! Good luck, everyone and don't forget to leave your name in the comment section! Be nice to have the right monitors in my new home! Would love to win....you can never be too safe !! Happy 2nd birthday Molly! I would love to win because I want to keep my family and furbaby safe. Can't ever be too safe! We have no alarms and it would be good to be more secure. I like to be safe! To keep my family and my animals safe. Because we just moved into a new house & we need everything! I would LOVE to win this to help keep my family safe. I want to keep my family safe. You have great products! I would love to win so I can keep my family safe. This would be a great prize to win! My detectors need some serious upgrading! I would love to win this. We could really use everything. I would love to win this. We could really use it. my stuff still works but would like to add more on different levels..
i would lvoe to win being that we are always needing to upgrade and update things in our house. since its 11 yrs old. Safety First! Would also like to share with my parents. I would love to win to keep my children safe. great life saving things to win! I would love to upgrade my current products and add some new safety items! Thanks for the important work you do, Molly! Thank you First Alert for supporting Molly and her work! My detectors are old and we have gas heat. To step up our families readiness & protect them. I would like to win so I can keep my husband and I safe. It would be great for our preschool/daycare! i would love to win because thats my dogs name and its her birthday in july. No joke. I would like to win so I feel safer in my home. My pups, Ashley & Patches want me to tell you "Happy Birthday". Great prize, I would love to win! My smoke alarms are old and could really use updating! We need to update these in our home. And the kids would love the picture. I need new fire extinguishers - I inherited mine from my father and don't know if they are good or not. I would love to win because it is time that we replace our smoke alarms an this would certainly be helpful. FA rocks, could put all this stuff to good use. 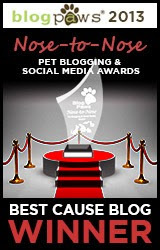 This would be a wonderful prize package to keep my family and dog safe! I'd be so happy if I won any of your great, life-saving products! Any of them could be put to immediate use in my older home!! Buying an old house, I need to change all the alarms and this would help:) Safety first! I would love to win. We just moved into a new house and there is no smoke alarms or other saftey. I want to keep my family safe and this would certainly help. Keep family safe and sound. I'd love to win because I live in a rental apt. and don't completely trust the alarms that are already here. Even renting, nice to have your own dependable safety items! We really need to change out our old smoke alarms and get a CO detector, as well. It's been on my to-do list for several months. Thanks for the chance from David Frantz from Ohio! Such awesome prizes! I really need them all for the safety of my family! Awesome prizes! I really need them all for the safety of my family! Wonderful prizes, that would be Great to win! Family safety is so important! I want to win because I want to be safe. It is important to be prepared. I would like to win because we had a house fire once and I want to be safe. To keep my family safe! Because we are leaving our teenagers home alone more, and would like to know that they would be safe and warned of a fire. Also, our fire extinguishers are so old, don't know if they even work. Would be nice to have new ones in case of a kitchen fire. could really use some new ones. I would like to win this because it would make me feel much more safe in my home. My biggest fear is dying in a house fire. I had my shop catch on fire and burn down about a year ago and we lost everything in it. It was so scary. I could use all the extra safety devices I can get. Thanks for the giveaway! i could use new ones. This would help keep my house safe, and give me a wonderful opportunity to review fire safety with my son. I would love to win and keep my family safe! We really need a couple more detectors on all floors...so this would be wonderful for our family! my daughter, her boyfriend & their 4 children are living with me & if I could win this & install, I would feel more at ease & safer in my house. :) Thanks! Could really use a new CO2 detector. I need to replace my very old products. These are items everyone should have but hopes to never use. 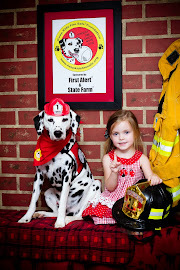 I would love to win because I raise my granddaughter and believe this is an excellent prize to teach her fire safety and natural gas safety for herself and our pets. I would love to win because co alerts and fire alerts keep people alive in those emergencies. I know some one whose furnace started leaking and almost killed them.With the alarms IO could sleep easier at night. 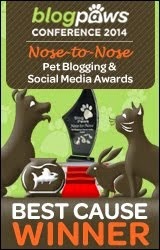 I want to win because 1) I love Molly! and 2) I want to keep my home and family safe and sound! Because you can never be too safe. Stuff always happens when you least expect it. First alert is first quality and my family safety comes first with me too. love to win. I would love to win this to give to my son who just bought a house so it's safe for his family and for my new grand baby. I would love to win since my fire extinguisher is out-of-date and I definitely need updated extinguishers and alarms in my home for everyone's safety. As a handicapped senior with only one working smoke alarm in my entire house, I would really like to win this package to provide the level of advance warning I would need to in the event of an emergency. As a handicapped senior with only a single smoke detector or no other alarms in my whole house, this package would do a lot to increase my comfort level and my chances of getting sufficient warning to make it to safety in the event of an emergency. I'd like to win so my home will be fire safe. which this I can feel and be safe. I would love to win to make our home safe! This would make me feel a lot safer in my home. I'd like to win because this is such a useful and wonderful package and it would make my kids and I feel so much safer. These would be great for our new addition. We have no CO2 detection and our home is in need of updated safety equipment. I would feel better if we had less ancient fire safety devices in our home. I sure could use this prize. I want to win to help keep my family and home as safe as possible. My safety equipment needs an upgrade! 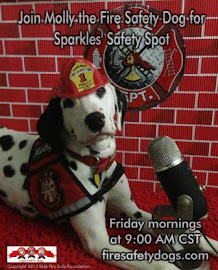 Fire safety is important and my dog wants the picture of Molly. I'd like to win to keep my family safe. A safe home is a safe family. I have a big old home and need to be careful for my family. This would be perfect to keep my family and friends safe. I want to keep my family safe! want to keep my family safe. You have great products! Nothing is more important than safety, so that's why I'd like to win. I don't have a working smoke alarm. Peace of mind for my family and 3 pets. I would like to win because Fire Safety is so important to my family. My son is a scout and we practice our escape plan on a yearly basis. This would be an awesome win for my little scout. Old houses! Would feel better with additional safety features! Keepin' everybody safe is priority...nice prize, perfect for any home. We only have one smoke alarm in our home. We need these. I would love to win - keeping the family safe is so important! My house has Old wiring and one fire alarm that is usually turned off due to it going crazy every time we cook. Our 40 year old doublewide will someday burn to the ground because of dry rotted wiring. I'd like to get out alive with my two dogs. I want to win because these are important items to have in my home. I especially need the fire extinguishers. My smoke alarms are now 9 years old and ready to be replaced! I could use some new alarms, plus, I have a grandchild on the way. Can't be too safe. I want to win to split it with my parents. I would feel alot knowing they had these safe guards in their house. I would love to win this to split with my parents. I know i would feel better knowing they had these safe guards. This would be a great to have in my home to keep us safe. Thanks. I would love to win this First Alert prize package. Keeping my family safe is a top priority for me! One can never have enough First Alert products! We could use this on our house. I'd really love to have fire extinguisers on hand in our home. I would like to win because I run a home for disabled adults and I am all about their safety. I want to protect my most valuable "possessions" --- my family! I need this, as I do not have a fire extinguisher in my home. I would love to win this because half the detectors in my house aren't working and we seriously need to replace them! This would be handy if there is ever an emergency. Wow. We would love to win this. Thanks. I would like to win so I could ensure my house is safe. I would like to win as my family means everything in the world to me and I want to keep them as safe as possible. Thanks for the giveaway…we need to update the smoke alarms at our place; also we have no CO detectors installed, or have any fire extinguishers. Being ready for all kinds of emergencies is the best gift I can give my family, including my pets. Looking around the house made me realize that I need some updating. It's a project worth carrying forward. I'd love to win this prize in celebration of my Yorkie's Birthday (June). I would love to win because we feel more safe and calm when we know that we are prepared for disaster. Living in Florida we know that disaster can strike at any time. could definitely use CO detectors and smoke alarms - old house! Can't imagine any better prize than the prize of safety!